When you need to fill out to look and feel healthier, add quality calories to your meals to encourage weight gain. To gain weight, your caloric intake must exceed what you burn in a day through basic body functions like pumping blood, plus other activities such as doing chores and exercising. Consult with a dietitian or check an online calculator to approximate your daily burn rate, and consume 250 to 500 more calories daily to gain at a healthy rate of 1/2 to 1 pound per week. Drink a glass or two of low-fat milk before bed as a nutritional way to increase your calorie intake and possibly promote muscle mass growth, especially if you participate in strength-training exercise. Milk helps you gain weight when it contributes to a calorie intake greater than what you burn in a day. A 2005 study published in the Archives of Pediatric and Adolescent Medicine showed that extra calories in the form of three or more servings of milk contributed to weight gain in children aged 9 to 14. The extra calories were responsible for the children's increase in body mass index, not any particular qualities in the milk. An 8-ounce serving of 2-percent milk contains122 calories. To use milk before bed to boost your daily intake by 500 calories and gain 1 pound per week, you'd have to drink between 4 and 5 cups every evening. Boost the calorie content by mixing each glass of milk with nonfat dry milk powder -- a 1/4 cup adds another 109 calories -- and make 1 cup equal to around 230 calories. If you stick to just one 8-ounce serving of milk fortified with 1/4 cup of dry milk powder, you'll gain a pound every 15 days or so. If you don't add the powder, It'll take you about a month to gain a pound by adding a cup of milk before bed every night, assuming you don't make any other changes to your diet. Gaining weight in the form of muscle is preferable to gaining additional fat tissue. To promote muscle gain, strength-train in addition to increasing your caloric intake. Target the major muscle groups at least two times per week with one set of exercises that make you feel fatigued in eight to 12 repetitions. Add weight and sets as you become stronger. In a 2007 edition of the American Journal of Clinical Nutrition, a study showed that consuming nonfat milk one hour after exercise promoted greater muscle growth in the early stages of resistance training when compared to soy or carbohydrate supplements. The milk was consumed an hour after exercise, not right before bed, but if you train later in the day, it could help augment your gains. A 2012 issue of Medicine and Sport Science published another study exhibiting that consumption of milk and other dairy products helped women gain lean mass and preserve bone while losing undesirable body fat. Again, consuming the dairy protein right after exercise was key in promoting these results. You can't guarantee that milk before bed will create the muscle-building effects for training done several hours earlier. Whole milk contains more calories than low-fat versions because it provides a little more saturated fat in each cup: 8 grams in whole milk versus 5 grams in 2-percent milk. Even if you're underweight, you're still vulnerable to the effects of poor dietary choices. Overconsuming saturated fats may increase your risk of heart disease, according to the American Heart Association. Avoid sweetening the milk with chocolate or strawberry syrup to make it more palatable. The extra sugar is not a quality source of calories. Make the milk into a smoothie with a banana and a scoop of whey protein powder, or add a teaspoon of honey if you need a change of flavor. The smoothie will add bonus healthy calories, too. Instead of just using milk before bed to gain weight, consider adding more calories at other times of the day too. Reach for an extra snack such as a handful of nuts or a bowl of granola cereal. Boost calories at meals in the form of olive oil, sunflower seeds, an extra serving of protein, whole-grain bread, nut butter or avocado. Can I Drink Milk Instead of a Protein Shake? 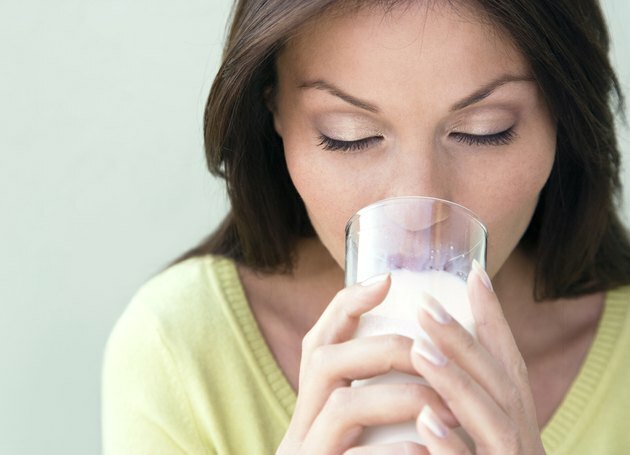 What Kind of Milk Can I Drink on a Diet?